In a previous post, I argued that the European Union would violate its WTO obligations under the WTO Anti-Dumping Agreement (ADA) if EU anti-dumping investigators will continue to apply ‘non-market economy’ (NME) treatment of Chinese exports in AD investigations under the EU Anti-Dumping Regulation (ADR) after December 11, 2016. It is on that day that Art.15(a)(ii) of China’s Accession Protocol (CAP) expires. Until that date, Art.15(a)(ii) provides WTO members with the right to use non-standard price comparison methodologies to determine whether and to what extent Chinese exports have been ‘dumped’ onto a third country market. The provision has served as a legal basis for a highly effective trade defense remedy that allows for the imposition of extraordinarily steep anti-dumping duties against Chinese exports, and Chinese exports of steel products and solar panels in particular. After the expiration of the said provision, the adoption of EU AD measures against China that are based on the use of non-standard price and cost comparison methodologies will be highly vulnerable to legal challenge in WTO Dispute Settlement (DS) proceedings in Geneva. This conclusion, however, does not prejudge the legality of AD measures that the EU has (or will have) adopted against Chinese producers prior to the December deadline. 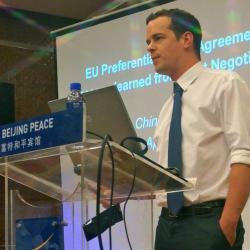 The question about the post-2016 legality of already existing EU AD measures that are “not based on a strict comparison with domestic prices or costs in China” (Art.15(a)(ii) CAP), is particularly relevant in context of the rising amount of new EU AD measures and investigations against Chinese producers of steel and solar panels that the EU has imposed and initiated in the last 18 months. It is this very question that is subject to analysis in this post. In July of this year, the European Commission’s legislative proposal will be submitted to the legislators. The proposal is then subject to potential amendments by the EP and Member States in the Council and ought to be adopted before the December deadline in order to protect EU AD proceedings from legal challenges. For the politics of the legislative process, it is noteworthy that, while the EP is involved in the adoption of the AD regulation, the adoption and implementation of individual AD measures is an exclusive right of the Council, who responds to Commission proposals. The political opportunity to deliver policy outcomes to EP constituencies in regard of this a priori protectionist trade policy instrument only arises at the stage of legislative reform of the ADR itself, but not in the course of the policy implementation process. Are Existing EU anti-dumping measures WTO-compatible after 2016? China’s Accession Protocol, to begin with, does not give any textual or contextual indication for a third country obligation to terminate existing AD measures against Chinese producers on or before December 12, 2016. Thus, in regard of the CAP, we are left with the conclusion those AD measures that were adopted before the deadline and are based on non-standard methodologies will remain valid after December 2016. WTO members’ trade defense investigators may not, however, use non-standard price and cost comparison methodologies in proceedings under the ADA after December 11, 2016. AD measures, however, are subject to a ‘sunset clause’, which is codified in Art.11.3 of the WTO’s Anti-Dumping Agreement. The purpose of the provision is to preclude the indefinite application of AD measures after their adoption. The rule requires that “(…) any definitive anti-dumping duty shall be terminated on a date not later than five years from its imposition (…)”. The lifespan of EU AD measures that have been imposed prior to the December deadline is thus limited to five years. The only way to extend the duration of such a measure is the request of an expiry review on behalf of the domestic industry or on the initiative of domestic government authorities. An expiry review entails a full anti-dumping investigation and is subject to the material and procedural requirements of the ADA. These requirements are frequently transposed into WTO members’ domestic laws and regulations, such as the EU’s Anti-Dumping Regulation of 2009. As such, expiry reviews that are initiated after the December deadline must entail ADA consistent price and cost comparison methodologies under the post-CAP AD regime and would hence result in the calculation of much lower – if any – AD margins compared to the results attained under non-standard methodologies applied under Art.15 CAP. Both domestic industries and WTO members’ government authorities will thus lack incentives to initiate such reviews in regard of AD measures that were adopted prior to the December deadline. As a preliminary conclusion, AD measures will henceforth have to be phased out over the course of five years, counting from the date of the adoption of each and every individual measure. AD measures adopted under the CAP regime, however, may nevertheless have to be terminated before the end of the 5-year period. Art. 11.1 ADA codifies the general principle that “an anti-dumping duty shall remain in force only as long as and to the extent necessary to counteract dumping which is causing injury”. Art.11.2 ADA, in conjunction with Art.11.4 ADA, elaborates and specifies the contingency-based and time-bound approach of the ADA with regard to trade defense remedies, which is generally framed by Art.11.1 ADA. Art. 11.2 ADA gives Chinese producers, exporters, and government authorities the right to request an interim review – i.e. a full AD investigation – before the end of the usual five-year lifespan of a measure. The purpose of the review a determination of whether an AD duty, at the time of the request and beyond that date, continues to respond to the existence of ‘dumping’ within the meaning Art.2.1 and 2.2 of the ADA. The administration that has authored the measure has limited discretion to reject the request for interim reviews. Yet, two conditions must be fulfilled: First, a reasonable period of time must have passed since the adoption of the measure. The EU, in the ADR of 2009, has interpreted this period to last one year following the imposition of the duty (ADR Art.11(3), first sentence). Secondly, the applicant must submit “positive information” that “substantiates the need for a review” (Art.11.2 ADA). By inference drawn from ADA Art.11.2, second sentence, a “need for a review”, would be substantiated if the information submitted by the applicant provides “positive information” to the claim that the “continued imposition of the measure” will not “be necessary to offset dumping” after the review is concluded. The result of the review must rely on an ADA consistent determination of ‘dumping’ and the determination of the potential extent thereof. It is noteworthy, in this context, that the ADA concept of “positive information” has been translated as “sufficient evidence” in the EU ADR. The important question is therefore whether the European Commission will, in response to Chinese producers’ interim review requests, consider the submission of producer and industry specific price and cost data in conjunction with the expiration of the CAP exception as “positive information” (Art. 11.2 ADA), i.e. “sufficient evidence” (ADR Art. 11(3), third sentence). Moreover, in the course of an admitted interim review, how would such evidence effectuate the determination of ‘dumping’ and the prospect of the “continued imposition” of the original measure? If the interested party can, in its request, provide evidence indicating that an ADA consistent EU anti-dumping investigation could result in a finding of ‘no dumping’ or ‘lower dumping margins’, the Commission will be obliged to engage in a full AD investigation subject to the post-2016 regime’s price and cost comparison methodologies. A subsequent finding of ‘no dumping’ or ‘less dumping’ requires that the original measure is “terminated immediately” (Art.11.2 ADA) or adjusted to the updated AD margin. The review, in any case, must be made within 12 (Art. 11.4 ADA) to 15 months (Art.11.5 ADR). At the final stage, it is the Council that acts upon a proposal put forward by the Commission. Given the incentives provided by the prevalent WTO and EU legal institutions, Chinese producers are highly likely to request interim reviews of existing EU AD measures in late 2016 and early 2017. If these requests are denied by the Commission, such acts will be open to legal challenge before the EU Court under Art.263(4) TFEU. Moreover, Chinese government authorities are then likely to challenge the denial of interim review requests within the context of WTO dispute settlement proceedings. The first WTO panel dealing with this issue could be established as early as spring 2017. In the proceedings, the complainant will need to provide support to the claim that the party it represents had provided “positive information” – or “sufficient evidence” – to indicate that an interim review investigation could have resulted in a determination of ‘no dumping’ or ‘lower dumping margins’ under the ADR, and the ADA respectively. Conversely, the complainant can seek to demonstrate that it was but for the denial of the request that the Commission had not come to such a conclusion. If the Commission admits Chinese producers’ AD interim review requests, however, the modalities of these reviews are then subject to EU obligations under the post-2016 ADA regime, if not an ADA consistent ADR. The continued imposition of EU AD measures that are based on determinations of dumping, which do not rely on Chinese domestic prices in accordance with ADA Art.2.1 or cost constructions in accordance with Art.2.2 ADA are hence vulnerable to challenge in WTO dispute settlement proceedings, if not before the EU Court in Luxembourg. It is further conceivable, in any case, that Chinese producers and government feel inclined to contest the assumption that “a reasonable period of time” within the meaning of Art.11.2 ADA is adequately reflected by the phrase “the period of time of at least one year” in Art.11.3 of the EU’s ADR. In light of the expiry of the CAP’s ADA derogation on December 11, 2016, it may be convincingly argued that much less time ought to pass between the imposition of a measure and the request for an interim review, for that request to be admissible. It may well be the date of that event rather than the prior duration of the measure in question, which determines the maximum duration of “a reasonable period of time”. An ‘option map’ prepared by the trade defense directorate of the European Commission’s DG TRADE outlines an alternative scenario in which the Commission denies Chinese producers’ interim review requests on the basis of the claim that a change in the applicable WTO legal regime does not constitute a change in factual circumstances. Interim and expiry reviews, in line with this approach, would be conducted in further application of the expired right the use of non-standard price and cost comparison methodologies. It is hardly conceivable, however, that this approach would not be subject to litigation, if it finds its way into the law and practice of EU Anti-Dumping following the adoption of the ADR reform in the months to come. IF the EU reform of the 2009 Basic Anti-Dumping Regulation follows the recommendations voiced in the franco-german letter to the EU Trade Commissioner and the EP resolution the ADR itself as well as future EU AD measures that will be highly vulnerable to legal challenge in WTO dispute settlement proceedings. The same is true, moreover, for EU AD measures that have been adopted against Chinese producers under the CAP regime prior to December 11, 2016, if EU law and practice, after that date, denies ADA conform interim reviews or base such reviews on ADA inconsistent price comparison methodologies. In the past, Members of the European Parliament and Members States represented in the Council have frequently advanced unconditional and relentless efforts to promote the rule of law as a core European value at home and abroad likewise, quite in line with the EU’s external action objectives under Art. 21 TEU. Concerning the questions raised in this column, however, it may be the plain prospect of a flood of rather immediate legal challenges – both at the EU and WTO level – that could still make for a considerable factor in the course of the ongoing deliberations associated with the legislative process. At the political level, the current global economic environment may yet inspire the negotiation of an EU-Sino compromise on the matter. Such a compromise, could conceivably allow for a 5-year phase-out period for all EU AD measures adopted under the CAP regime, starting on the date of the imposition of every individual measure, subject to a (no-litigation) ‘peace-clause’. The EU, in response, would guarantee the ADA conformity of its post-December AD regime. Should the Union decide to ignore its WTO obligations on such a massive scale, it ought to hold itself accountable for the further erosion of the rules-based multilateral trading system that it once helped to build in its very own interest. Furthermore, EU political leaders should be under no illusion that such a step back into the direction of the lawless jungle of international economic relations will alienate a vital partner in times of an increasing fragility of traditional alliances and dynamic global power shifts. Finally, it appears conceivable, to say the least, that the partner in question will deduct the costs incurred in this process in a currency other than trade revenues. Rather than frustrating WTO members’ credible expectations, which are anchored in negotiated legal disciplines, EU political institutions should fully exhaust the sufficient alternatives of WTO consistent trade remedy design and practice under the ADA as well as the SCM Agreement and promote social mitigation strategies for industrial sectors in decline.